2003 Ford F150 crewcab v8 engine automatic transmission 180k miles interior of the truck is immaculate, no rips, no tears, not even many signs of wear and tear, COLD a/c and hot heat. all windows go up and down. radio works well as everything else in the truck The exterior is in top conditions. 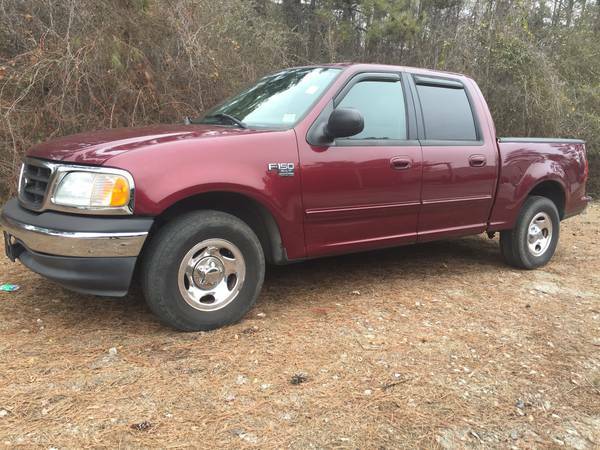 no scratches, no dings no dents, absolutely fine glossy burgundy paint all over, this has been a GA truck since new. Mechanically is in excellent conditions, there are no leaks, no noises at all, we took this truck as a trade in in our mechanic shop and put all services and conditions up to date and now we can confidently say is in tip top shape from head light to tail light.